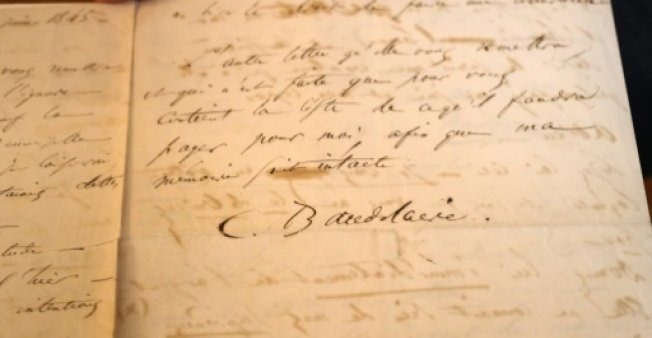 PARIS — A letter written by nineteenth century French poet Charles Baudelaire announcing his intention to kill himself sold at auction on Sunday for 234,000 euros (US$267,000), three times the expected price. Best known for his collection of poems Les Fleurs du mal (The Flowers of Evil"), Baudelaire was 24 at the time he wrote the letter to his mistress Jeanne Duval in June 1845. It was bought by a private collector, the Osenat auction house said. "When you receive this letter I will be dead.... I am killing myself because I cannot carry on living, I can no longer endure the ordeal of falling asleep or waking up again," the poet wrote. Baudelaire stabbed himself but failed to do any serious damage and lived for another 22 years.